The Pew Charitable Trusts has named Hinrich Boeger, assistant professor of molecular, cell, and developmental biology at the University of California, Santa Cruz, a Pew Scholar in the Biomedical Sciences. Boeger will receive $240,000 over four years to support his research on the mechanisms involved in regulation of gene activity in cells. The Pew Scholars Program in the Biomedical Sciences, funded by the Pew Charitable Trusts, is designed to support young investigators of outstanding promise in the basic and clinical sciences relevant to the advancement of human health. Nominations for the prestigious awards are invited from a limited number of institutions selected on the basis of the scope of their work in biomedical research. Boeger studies how DNA is packaged in the chromosomes and how the packaging mechanisms are involved in the regulation of gene activity. "All the cells in our body contain the same DNA, and the reason cells differ and can perform different functions is because different sets of genes are turned on in different cells," Boeger said. Chromosomes consist of a complex structure of DNA and proteins called chromatin, which allows several feet of linear DNA molecules to be neatly packaged within the microscopic nucleus of every cell. Increasing evidence points to changes in chromatin structure as an important mechanism for gene regulation. In particular, Boeger's research indicates that the nucleosome, a basic building block of chromatin structure, plays a key role in turning genes on and off. Boeger's lab studies gene regulation in yeast cells, focusing on a regulatory element in the DNA called a promoter. He has shown that activation of the promoter involves the complete unfolding of the nucleosomes in that section of DNA. Furthermore, his studies suggest that nucleosomes are continually removed and reassembled during promoter activation. "Under activating conditions, the promoter is switching between transcriptionally active and inactive states, and this seems to involve the disassembly and reassembly of the nucleosomes," Boeger said. "So promoter activation involves the transition from a static to a dynamic state and eventually approaches a dynamic equilibrium of nucleosome disassembly and reassembly." With support from the Pew Scholarship, Boeger plans to further investigate this process, trying to understand the mechanisms involved and to what extent it is a general phenomenon in gene regulation. Unlike many traditional research grants with strict guidelines on how funds must be used, the Pew Scholars Program in the Biomedical Sciences allows recipients flexibility in choosing their research agenda and, in fact, encourages them to become entrepreneurs by taking calculated risks and following unanticipated leads to maximize the benefits their research brings to society. The program was launched to provide crucial support to researchers in the early- to mid-stages of their careers. Boeger earned his B.S., M.S., and Ph.D. degrees in biology from Christian-Albrechts University in Kiel, Germany. He conducted his Ph.D. work in the laboratory of Peter Gruss at the Max Planck Institute for Biophysical Chemistry in Goettingen, Germany. 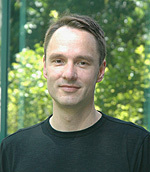 After a postdoctoral position at Stanford University, Boeger joined the UCSC faculty in 2006. Note to reporters: You may contact Boeger at (831) 459-4487 or boeger@biology.ucsc.edu.